To review a comic book you love can be extremely difficult. I’ve said it before, but it’s maybe never been more true than it is here. 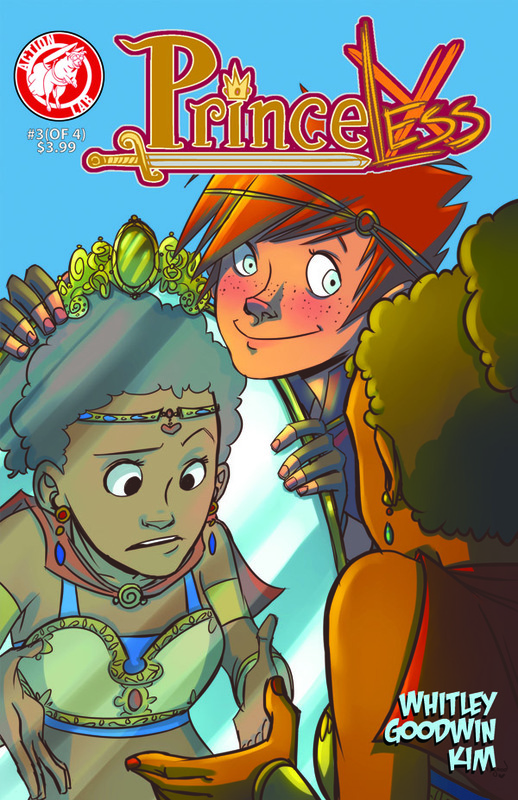 With each issue of Princeless so far, Jeremy Whitley and M. Goodwin have had a pretty effortless go at capturing my heart, and issue three is no exception. If anything, they’ve only further tightened their grasp on me here, and talking about a book that I am so blindly in love with might be … well, kind of boring for you. So my apologies ahead of time if that turns out to be the case. There’s only so much I can say here that I haven’t already said for issues one and two. Issue one took me so wholeheartedly by surprise that it was just like a punch in the face—a really, really GOOD punch. The kind of punch I want more comics to give me. Issue two, then, grabbed onto me tight and told me I’d better not think about going anywhere. Issue three? Swept me off my feet. And this is where I’m torn. Because I don’t completely want to tell you why. I could. I could get all technical and analytical, and dig past the surface. I’ve summarized the plot in previous reviews; I could use this to talk some more about the skill of the storytelling happening in this book—the message behind the tale, what audiences it plays to, what themes, and why. I could discuss some of the more important things the book represents, such as independent publishing and why you should read more works by unknown creators. But honestly? I don’t want to do that. Because this book doesn’t deserve to be dissected. Don’t read that the wrong way—it’s not meant negatively. Rather, sometimes I wonder, can’t we just let the quality of things speak for themselves? There are hundreds of other sites out there all talking about exactly the same thing as one another. There are plenty of other blogs for you to read about all the things I just mentioned above. I’m far from the only one “reviewing” this, and after a while, it all just starts to sound the same, doesn’t it? This comic does a lot of things right, and you can discover on your own what those things are—because isn’t that all part of the fun? 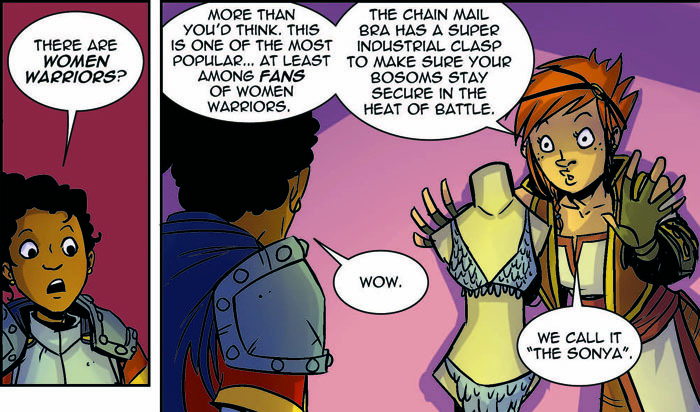 So try Princeless for no reason other than it being a great comic. Something new. Surprise yourself. Give it to the kids in your life. Pass it on. Don’t let a gem like this go unnoticed on the shelf because you’re too busy picking up “Fear Itself: The Fearlessly Fearful Feary Fear” that Marvel’s selling you for like five bucks a pop, that won’t satisfy you a sliver as much as a book like this will. I mean. At least try it. What do you have to … Fear? This entry was posted on 01/13/2012 by ravenhaired. It was filed under Awesomeness, Comic books, Female Characters / Creators, Reviews and was tagged with Action Lab Entertainment, Badassery, Jeremy Whitley, Princeless. Reading your review of Princeless #3, the line “Because this book doesn’t deserve to be dissected” made me think of a poster I have of one of my heroes that has a quote at the bottom that I think you would appreciate. Yes, that’s it exactly. Very appropriate. Thank you, Paul! Totally was not trying to, um, roll up on your blog and get all “Ooh! It’s my man!”. You could, um…delete that…if you wanted to.